Cholesterol has become the scare word of medical discussions, especially among older people. 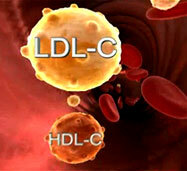 HDL and LDL level numbers are recited like score sheets of health. The claim that high levels can be a major cause of heart disease, is simply not documented. Many studies that make the claim are funded by drug companies even though they are carried out by universities and medical schools. Lipitor and Crestor and Zocor, cholesterol lowering drugs all and some of the most popular drugs in all fields, sell over 15 billion dollars worth of these drugs every year. If the scare goes away, so do billions in profits. What it is not...It is not a danger to your general health even at what might be called elevated levels. Where does it come from?...Primarily in your liver (about 1,000 milligrams a day), but it is also created by cells lining the small intestine and by individual cells in the body. About 85 percent is produced by your body. The other 15 percent or so comes from an external source -- your diet. Your dietary cholesterol originates from meat, poultry, fish, seafood and dairy products. Is it good, bad or both?,...Lipoproteins carry it through the blood to cells in the body that need it. Low Density Lipoprotein, LDL, is supposedly the bad stuff. Theoretically the low density allows these to become stuck to artery walls, leading to atherosclerosis and other heart disease. High Density Lipoprotein, HDL, is a sort of artery cleaner believed to help prevent blockage. What are statins?...Prescription drugs such as Lipitor, Zocor, and Crestor designed to lower LDL levels by acting directly on the liver. This is an unnatural altering of a natural body process which carries with it risk of side effects and long term harm. Can diet lower the levels?...Not to any beneficial degree since only fifteen or so percent comes from diet. The body is going to produce a certain level according to it's needs. When you reduce dietary intake, the body just produces more in the liver. Here's some interesting information from the Mayo Clinic. Fifty percent of the people who are hospitalized with heart attacks have normal levels. What’s more,twenty five percent of people who develop premature heart attacks have no traditional risk factors at all. If the hypothesis that a fatty diet causes heart disease is true, why has over fifty years of trials and studies failed to confirm it? People who are aware that long term health is a result of a healthy, natural diet, regular exercise, and a peaceful, stress free attitude, don't concern themselves with LDL and HDL numbers.